If you are just getting into the hobby of reloading, it won’t take you long to figure out that a good bench is a very necessary piece of equipment. Almost all of your major reloading tools are going to require a bench to mount them to, and a good sturdy bench is going to help you keep all of your tools and supplies organized. Ready-made or store-bought benches are oftentimes poorly constructed, weak, or just not good for reloading. If you want the best bench for your setup, the best thing to do is custom make one you! Odds are, if you are capable of reloading your own ammo, it should be well within your skill set to construct a basic workbench, and many designs can be made both cheaply and easily. Listed below are a few of my favorite bench designs, along with complete instructions on how to build each one! If you are looking for a quick and easy project with minimal construction required, this may be a good bench to check out. It is small, with minimal storage capacity and a pretty limited work area, but it is quick and easy to make, and is collapsible for easy storage. It also utilizes a premade base from Black & Decker, so that will minimize time and effort spent on construction. If you have a limited selection of tools, or live in a small space such as an apartment, this may be a good bench to try out. If you are an experienced carpenter looking for a high-quality bench designed specifically for reloading by the National Reloading Manufacturers Association, then this is the bench for you. It is a slightly more advanced project and includes a foldout shelf and quite a few cabinet doors. This is definitely doable for the average Joe though, as the plans listed in the PDF are very thorough and easy to read. You can expect to spend a bit more money on hardware and lumber to make this bench look nice, but the end result will be a time-tested design that will last for years to come. Much like the bench listed first, this bench is also a compact design that utilizes a Black and Decker foldable base, which will cut down on your materials and construction time. This foldable bench will go much flatter than the previous one listed, but in order to do so, you sacrifice the raised shelf space. But by doing that, it also makes the project much easier and cheaper to make. In fact, this design can be built with just a few bolts and a single piece of plywood! If you don’t want to mess with very much cutting or gluing, this would be a good bench to check out. If you are looking for an intermediate level design that can still be built easily and quickly, then this would be a good bench to start with. This is going to be slightly more difficult than the basic benches that use pre-fabricated parts, but it is going to be far easier than the more complicated benches that include drawers and cabinets. This is a basic 2 level bench with a few upper-level shelves and a pegboard backing that can be used to hang a few tools and supplies. It uses 4×4 lumber for the legs and has a sturdy base, which will make this a good quality, sturdy, and simple bench. If you are looking for something that is going to be high-quality, yet still easy to make, then this would be a good bench to check out. If you are looking for a very basic, DIY workbench without any extra frills, then these plans provided by Lowes are worth checking out. There are no cabinets or raised extra shelves, so this would be a great option if you have any sort of height restriction on your bench. It also utilizes only 3 different kinds of lumber (2×4, 2×8, plywood) so that it will make your shopping list convenient and cheap. Eliminating the use of 4×4 for the legs will cost you a bit of stability, but it will save you quite a bit of money and be much easier to build and transport. If you are looking for a cheap, easy bench project that would be great for a beginner, then this is a good plan to check out. This bench is pretty similar to the above bench from Lowes, but with a few extra steps. This bench utilizes many of the same construction methods, but is built entirely from 2x4s. This means that you will have to do a bit of extra work on the bench top, since you are not covering it up with plywood. That also means that this project will be a bit cheaper to do, and can often be built for under $100. If you have intermediate level carpentry skills and would like to save a bit of money on your workbench, this is an excellent one to try. 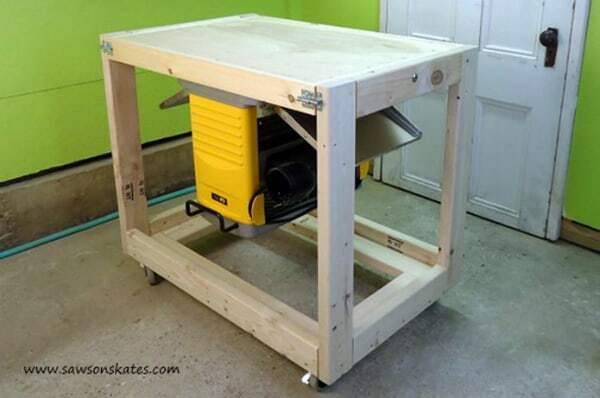 If you have intermediate to advanced level carpentry skills and are looking for a workbench that can be built quickly, cheaply, and has plenty of drawers and storage space, then this would be a good place to start. This is a fairly cheap bench, and can easily be built in just an afternoon. A reloading bench with drawers is much more secure than cabinets or plain shelves, but it is often times harder to store tools and keep them organized in drawers. However, if you have children, frequent visitors, or just want to keep your supplies kept secure and hidden, then this would be a great bench for you. If you are a beginner carpenter on a budget, but would still like a high-quality reloading bench that looks nice and has a lot of features, then this would be a good place to start. This is a bench that is not only cheap, but can be constructed relatively easily in only an afternoon. This bench isn’t light on features either, several shelves, pegboard to hang tools, and even an area to mount a fluorescent light if you so choose. This is a great bench that is loaded with features, but in order to do all of that, it does sacrifice some stability. While it will still be adequate for a basic budget reloading bench, it may leave you wanting a bit more down the road. If you have a good bit of experience with carpentry and are looking for a compact, foldable bench that can be rolled away and stored when not in use, then this may be a good option to consider. This bench is quite a bit more complicated than your average basic bench and incorporates the use of caster wheels and hinges. This is a handy design for the person who doesn’t have a whole lot of space, but still likes to spread out and have a lot of room to work when it’s time to reload. Keep in mind that the hinged fold-out sections are sturdy enough to work, but will not be nearly as stable as a bench that is built in place and not foldable. That being said, this bench is an excellent compromise between portability and stability, and would certainly serve the space-conscious reloader well. If you are looking for a slightly more difficult and involved project than your average bench, then you may want to give this expanding garage bench a look. This bench would make a great reloading setup in a garage where space is a concern. It offers a small standard workspace, plus an additional fold out worktop that gives you extra workspace when you need it, and extra parking space when you don’t. One thing to keep in mind is that this project uses a few more tools than the average bench. With most benches, you can get away with just a power drill (you may not even need a circular saw if your local hardware store offers cut-to-length services). This project, however, requires the use of a jigsaw and other less common hand tools. If you feel up to the challenge and really need the extra space, this may be the bench for you. This is another bench that would be great for the reloader in a small space, and is very customizable. This bench can be hinged, rolled, folded, and slid into almost any shape you would like, as both the quantity and purpose of each of the bays is totally up to you. 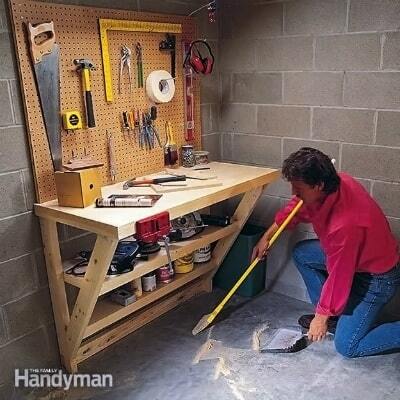 With this bench, you can set everything up to have a full gunsmithing shop in your basement, and then store everything neatly against the wall when you are done. This is a slightly more complicated project and will cost a bit more money, but the space savings and customizability make it worth it. If you are looking for a lot of workspace that stores away easily, this may be a good bench to build. This is one of my favorite bench designs, and it is perfect for reloading, especially if you like to sit while you reload. This bench has a triangle frame and mounts to the wall, so it takes up almost no floor space at all, while still giving you plenty of workspace to reload. One of the best parts of this bench is that the smaller lower shelves give you plenty of room for your legs underneath the bench. This is perfect for the reloader who likes to sit while they work, as it allows you to sit much closer to the bench top. If you are hard pressed for floor space, or just love to sit while you reload, then you may want to consider this bench. 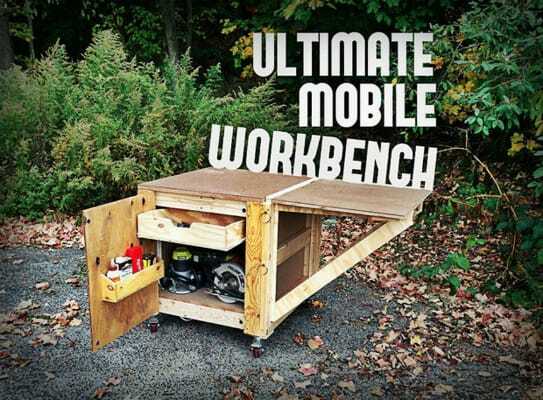 If you are an advanced carpenter who is looking to tackle a big project, then this ultimate workbench may be just the project for you. The bench pictured includes built-in table saw and air compressor, but these can easily be swapped out for other tools more suited to reloading. It also includes ample divided storage space underneath to store all of your reloading tools and components. Part of the reason that this bench is so complicated is that the instructions are not very clear, and it uses a lot of reclaimed parts that are not necessarily common at your local hardware store. If you are a good carpenter and are willing to do a bit of extra legwork yourself, then this may be a good design for you to follow. If you are a fan of the traditional workbench design and would like to translate that into your own reloading bench, then this would be a good design to try. It is simple, yet sturdy and retains the old-time aesthetic of a traditional workshop. This can be much more than just a reloading bench, it can be a part of your decor. This bench is as functional as it is beautiful, and when built correctly can be a bench that you are not only proud to reload on, but proud to display in your house as well. This bench does lack any sort of storage space, but if aesthetic and design are important to you, then this may just be the perfect bench. If you are looking for a good, rolling worktop with plenty of storage underneath, then this may be a good option for you. The caster wheels allow this to be rolled virtually anywhere you need it, and the ample shelving underneath gives you plenty of room to store all of your tools and components. There is nothing fancy about this bench; no fold out shelves or fancy drawers, which make it much easier to construct. If you are looking for a simple, easy to construct rolling bench with plenty of storage, this may be a good bench for you. If you are really pressed for space and need the smallest collapsible bench you can build, then this may be a good choice for you. This bench folds almost completely flat for easy storage, yet expands out to a full-size bench. This can make things a bit complicated when it comes to mounting all of your reloading tools, and would most likely require you to dismount all your press and powder measure before storage. However, if you live in an apartment or otherwise have no space, this would be a great option that would still allow you to be able to reload. If you are pressed for both time and money and looking for a good bench that is both cheap and quick to build, you may want to give this easy bench a try. It is both affordable and easy to make with a simple design that is both functional and elegant. Once painted, this bench will hardly be the eyesore that other benches are, which would make it an excellent candidate for a reloader with a better half to please. The bottom shelf does give a fair bit of storage, but it lacks any cabinets or drawers, which may cause problems if you have a lot of supplies and equipment. Overall, this is a stylish bench that would look good in almost any home, while still being sturdy and very functional. If you have advanced carpentry skills and are looking for not only a fantastic bench, but also one that will be unique and totally one of a kind, then you should take a look at this raw timber bench. This bench involves no trips to the hardware store for lumber, as the instructions walk you through cutting your own timber from a plain tree. This bench is beefy, unique, incredibly sturdy, and just plain cool. This is not just a bench, but a conversation piece. Sure, anybody can go to the hardware store and build a bench out of 2x4s, but how many people can turn a plain tree trunk into their next reloading bench? If you want a truly one of a kind bench and aren’t afraid to put in the work to do it, this would be an excellent bench for you. If you already have a rolling tool chest and are looking for a quick and easy place to set up your reloading supplies, then this may be the best bench for you. This is one of the most simple benches to make, as it consists of only a hard wooden top mounted on top of your tool chest! This a rather ingenious, incredibly simple design that uses something that you already have on hand to make your life much easier. Plus, the drawers in the tool chest will give you ample storage space for all of your reloading supplies. 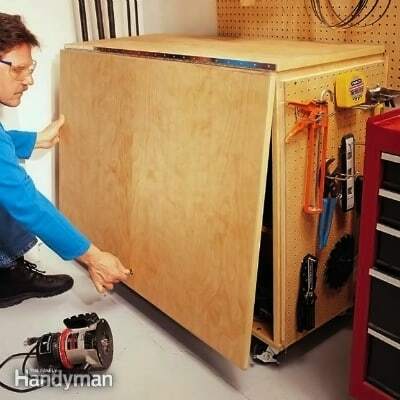 If you already have a rolling tool chest and are looking for a quick and simple project, then this may just be the thing you’re looking for. If you are looking for a basic, simple bench that is both portable and good looking, then you may want to check out these plans. The wood used is stained and sealed to give it just the right amount of shine to guarantee that it won’t be an eyesore in your home. And the 4 caster wheels mean that it can be rolled anywhere it needs to be, including into a corner out of the way when it’s not being used. If you are wanting a simple, functional workbench that will get the job done and still look good, then you may want to look at this one. If you are looking for a solid, permanent bench to build in an unfinished garage or room, then this could be the thing you’re looking for. This sturdy bench utilizes the existing bare studs used to frame out your room, which makes it very sturdy. It also uses metal angled braces instead of front legs, which makes it much easier to sit at. You will need to keep in mind that this bench will be built into the framing of your room, and it will not be portable or able to be easily moved at a later date. It will also make finishing the room much harder. If you plan on leaving your reloading room unfinished and want a solid bench that is built into the room, then this may be what you’re looking for. If you are looking for a unique and very functional reloading bench that has plenty of storage and is also mobile, then this may be the one for you. The caster wheels allow this bench to be rolled anywhere, and the flip out worktop is actually height adjustable! This is an excellent feature for the reloader who would like to both sit and stand at separate times during the reloading process. The built-in cabinet features plenty of storage space for all of your tools and supplies, and the whole thing can be folded up and rolled out of the way when it’s not in use! If you are looking for something that is compact and space-efficient while still providing plenty of storage and features, then this may be the bench for you. If you are looking for a unique and functional reloading bench, then this will be a great option for you. One of the best features of this reloading bench is that the top can be removed and flipped upside down! 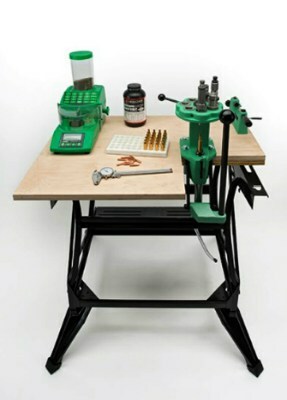 This is an excellent feature, as you can have all of your reloading equipment mounted to the bench when you want it, but if you just want a plain workspace all you have to do is flip the top back upside down! This bench does lack storage space, but if you have extra cabinets or shelves then this won’t be a problem. If you are looking for an interesting and functional reloading bench, then this just might be the ticket! If you feel like putting in the time and effort required to build this bench correctly, then you will end up with a professional looking, high-quality bench that is sturdy, looks great, and is very functional with plenty of storage. Making this bench look good will prove to be a bit of a challenge, so I don’t really recommend it as your first project. This bench features an attractive wooden top that is easy to mound your equipment to, and plenty of drawers underneath to give you ample storage for all of your supplies and equipment. If you are an experienced carpenter and looking for a great, high-quality reloading bench, this may be the bench for you. If you are pressed for space and would like a wall mount bench that also folds, then this may be the bench for you. This is a unique design, as the worktop splits in half instead of folding down. This allows you to leave your tools mounted much easier. Since this reloading bench mounts to the wall, there are no legs to worry about, and the footprint on your flooring is minimal. One downside to this bench is that it requires being mounted to the wall. This can be a problem for apartment-dwellers unless you are really good at hiding your mounting holes (pro-tip: toothpaste works great in a pinch for small holes if you don’t have any spackle.) If you have little space and don’t mind putting a few screws in your wall, this may be a great bench for you. With so many different plans and designs, the biggest challenge in building your reloading bench is finding your favorite design! While many of the benches will require some sort of modifications to fit you and your desires, each bench comes with adequate instruction to get you going on your very own reloading bench. I hope you enjoyed this list of reloading benches, and I hope it helps get you started on building one for your very own. 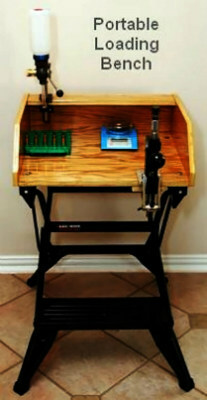 One thing is for certain: You will not regret building your own custom reloading bench! If you’re looking for more than what you see here, please review our Best Reloading Kit Buyers Guide and our Best Gun Safe Buyers Guide. Dan is an avid outdoorsman and shooter who developed a passion for firearms at an early age. When you can’t find him in the field chasing birds or big game, you can find him at the range shooting various competitions such as 3-gun, IPSC, and IDPA. He also enjoys manufacturing his own ammunition, as well as both working on, and building his own firearms. Dan has many years of firearms experience, and enjoys helping people find the right gear and sharing his extensive firearms knowledge.